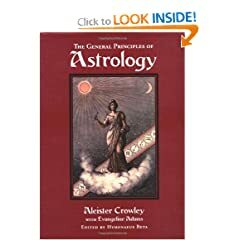 The General Principles of Astrology is available NEW from Amazon.com for only $58! It is a beautiful book. This first full-scale reconstruction of his essential text has waited 85 years to appear as he originally intended it. Long before there was Linda Goodman, long before astrology bestsellers turned up in supermarkets, there was Aleister Crowley, the most important astrological scholar and authority of the early 20th century. Ghostwriting for Evangeline Adams, it was Crowley who wrote the vast majority of her classic textbooks, Astrology: Your Place in the Sun (1927) and Astrology: Your Place Among the Stars (1930). General Principles of Astrology finally acknowledges Crowley’s authorship. Crowley’s goal was to abandon traditional assumptions, so he based his findings on actual charts and how they were expressed in people’s lives. In his characteristically clear and elegant prose, Crowley discusses each planet from a scientific and mythological point of view. He provides an exhaustive analysis of astrological types, drawing conclusions for over 180 astrological nativities of well-known artists, poets, musicians, philosophers, politicians, and business leaders from the 18th to the 20th century. This new book is composed of painstakingly gathered work, primarily ghostwritten by Crowley, and published in various early twentieth-century texts. It is published here in one volume for the first time, in an undertaking endorsed by both the Adams and Crowley estates.